Nominations for 2018/19 are now open. 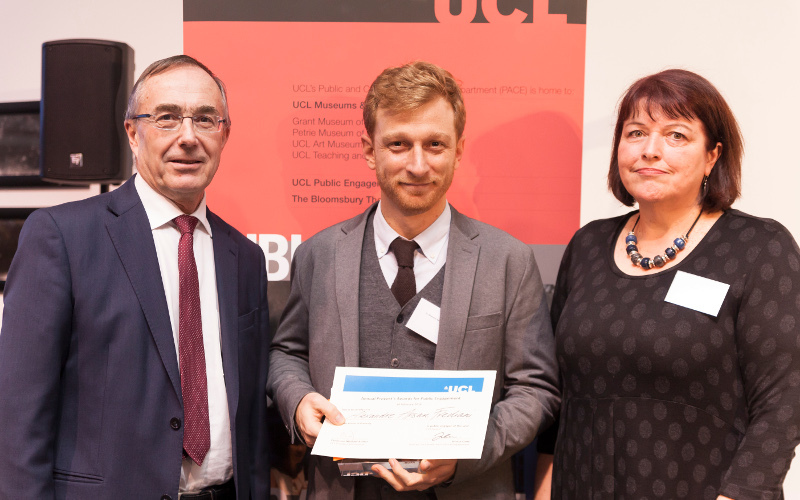 One of the highlights in the UCL public engagement year is the Provost's Awards for Public Engagement. The awards, which will take place in May, celebrate the fantastic work that UCL's staff and students, and their community partners, are doing to open up research and teaching at UCL to the wider world through collaborative engagement. A spirit of experimentation from which learning can emerge. We would like to encourage you to make a nomination. This as an opportunity to recognise the work of your colleagues and of the community partners they collaborate with. And do remember that community partners themselves may wish to nominate their UCL counterparts. Nomination for 2018/19 are now open. Please e-mail completed application forms to publicengagement@ucl.ac.uk. Deadline for nominations is 5pm on Monday 28 January 2019. Please do read through the guidance document. You can read more about last year's winners or download our list of all previous winners. Who, and what kind of work, is eligible? UCL staff and postgraduate research students are eligible for all awards except the Community Award. To be eligible for nomination they must be either employed by UCL or registered as a student at UCL, at the point of nomination or have been employed by UCL, or registered as a student at UCL, within the calendar year preceding nomination deadline date. Community partners are eligible for the Community Award and as members of the Team Award alongside UCL colleagues. Honorary UCL staff are only eligible in cases where the content of their nomination relates to work undertaken as part of their role as a member of the UCL community. The awards are open to professional services staff working in all capacities if they have been involved in public engagement work. Please do check the full eligibility criteria in the guidance document. If you’re uncertain of the eligibility of an individual or have any additional questions then do get in touch with us. Widening participation work with schools, or work that is intended to recruit students to UCL or higher education more generally, is not covered by these Public Engagement Awards. Other methods of recognition exist within UCL for working with prospective students, community volunteering, and promoting higher education in general. To be kept up-to-date with news about the awards and other activities, you can join the Public Engagement Unit mailing list. There's a summary of all the winners in our resource centre! Read up to find out what makes a winning nomination.